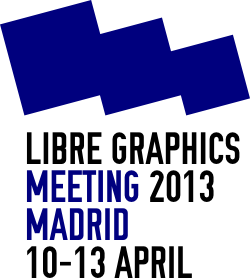 From 10-13 April, Medialab-Prado hosts the international Libre Graphics Meeting in Madrid, Spain. The event brings together developers and designers from all over the world to work on the many different tools in the Free, Libre and Open Source toolbox. This 8th edition focuses on (re)inventing a libre graphics workflow that supports collaboration and exchange. By Libre Graphics we mean Free, Libre and Open Source tools for design, illustration, typography, lay-out, art, photography, publishing, cartography, animation and video. The Libre Graphics meeting is not just about software, but extends to standards, fileformats and actual creative work. Hacksessions, keynotes, roundtables and presentations facilitate collaborations between programmers and artists, between projects such as Blender, GIMP, Scribus and Inkscape. Most importantly, the meeting is an opportunity to generate fresh ideas for future tools. This four day event is followed by Interactivos?’13: Tools for a read-write world, a two-weeks workshop to collaboratively prototype tools to design, edit, draw and write together. Interactivos?’13 is an open platform for research, production and learning where multidisciplinary groups of project leaders and collaborators work together with the support of advisors and technical assistants. 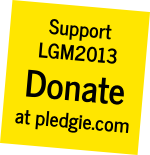 Since 2006, LGM has taken place every year. This year’s edition has been preceded by LGM 2006 in Lyon, France; LGM 2007 in Montreal, Canada; LGM 2008 in Wroclaw, Poland; LGM 2009 in Montreal; LGM 2010 in Brussels, Belgium; LGM 2011 in Montreal, Canada and LGM 2012 in Vienna, Austria.